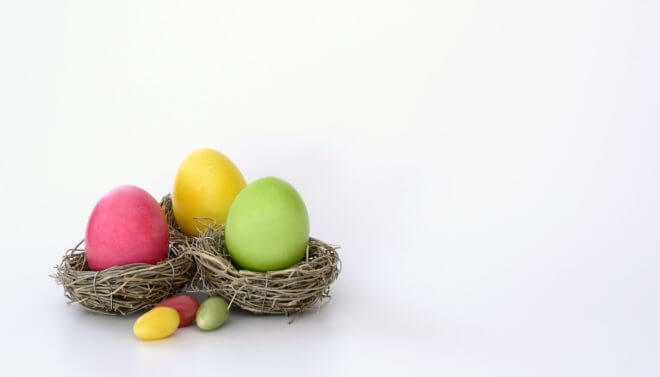 Easter hunts are living proof that your child can find things when they really want to – but it’s not all about chocolate! Read on for the best of Easter eating. Easter is about more than just chocolate bunnies and foil-wrapped eggs (although we love those too!). It’s about celebrating fresh starts and new hope. For food manufacturers the start of a new season brings the promise of a whole host of fresh and exciting ingredients for our talented chefs to play with. For the Quattro Foods chefs this is their chance to stretch their imaginations to their broadest culinary lengths – the sky is the limit. The cloudless blue sky of Easter that we poor sun-starved Brits are longing for. And with the first ray of sun comes the promise of a happy, fun-filled, family Easter. What does a Quattro Easter look like? If you follow our blog you’ll know that we are all about family and our regular readers will also know that our creative development chefs will do anything to keep the rest of us, our families and our customers, happy. And so they set about hunting down the freshest, sweetest, tastiest ingredients of the season to deliver a truly scrumptious Easter. Our chefs are currently working on two chocolate sauces for a dessert manufacturer to complement the ever-popular mango, passionfruit and mixed berry fruit compotes that are already in production. As a food manufacturer we sell these bespoke products to our customers who, in turn, sell them onto their clientele. Our customers include high street restaurant chains as well as independent retailers, food service providers and the NHS. Their end customers are so diverse and widespread that the ground we cover ensures that almost everyone gets to taste these yummy chocolatey Easter puddings. Our customers mean the world to us and we thought you may want to offer something other than chocolate up at lunchtime. So we’ve come up with an Easter treat for you. Here is a list of ideas for delicious Eastery menus from our ingenious food production team. Enjoy! Steam the asparagus, blanche the peas and edamame, whisk the mayonnaise with the lemon zest and lemon juice and season with salt and pepper. Pile everything into a bowl, gently toss to combine and sprinkle with feta and serve. Boil, peel and half the eggs. Scoop the yolks from the whites and add to a bowl with the avocado. Mash with a fork then add the minced red onion and lime juice and stir well. Season with garlic powder, paprika, salt and pepper, then add the avocado mixture to the egg whites. Melt the butter, add the anchovies and garlic and cook for 2 minutes, toss in the greens and cook for 8 minutes. Add the lemon juice and parmesan and stir well. Season to taste.